Looking at what WG has in store for us, how many of you will be taking a break from ships next patch? Personally I look to take an extended break from WoWs for the next 1-2 months, apart from maybe some Ranked (arms race looks possibly fun, and there will be no CVs). So for anyone who didnt watch Flamu and Notsers videos on the upcoming AA rework (accompanying the CV rework), here's the links. So, where is the fun in that for the 90% who don't play CVs? Ranked (arms race) will be playable, but will random battles? That Notser video is pain to watch. He start to switch the AA sector, when the planes approach and not before they approach. The carrier was in the north, so why having the south sector enforced? That is bad played. The AA sectors affect only long and mid range aa, and with his managing he doesn't do much. The AA is not only swapping the sectors, it needs some preparation and maneuvering. Not like Notser played that. I'm going to switch to ranked and coop. I might put some effort into ranked for once. ow many of you will be taking a break from ships next patch? Then again, hoping that this will be just the next patch... beyond optimistic. Wasn't it even said that WG plans to keep testing & changing stuff till like 0.8.4 which would be May? You could answer the question yourseld: What is stronger an AA denstity of 50% or of 150%? Density seems to be "shots", so 150% means 50% more shots than normal. Basically he flies around inside Worchester AA + Mogami AA for 1 minute and his planes doesn't give a crap about it. Starts with squad of 9 planes, first drop of 3 without losing even one, finally two excorting TBs go down at the end of 2nd drop which is still two full drops and 1 surviving TB after doing 2 drops. Sure why should planes care about the best AA cruiser in the game (provided Worchester knows where to find his DFAA button). I realize WG has to work out CV UI and gameplay before they can start balancing AA against that, but this level is just toxic. Infinite planes is more than enough for that purpose. Lots of room for improvement, but this is still Minotaur AA and he doesnt even shoot one plane down at the start. Also take a look at his BB video and you will see Montana AA in the reinforced side doing exactly squat to attack squadrons. Finally, notice the bugs? Torpedoes in the water merrily hitting ships despite having not red triangles on them (twice) as if they still unarmed. Starts with squad of 9 planes, first drop of 3 without losing even one, finally two excorting TBs go down at the end of 2nd drop which is still two full drops. Look at how fast the HP pool of the planes is depleting before he drops. So one aa cruiser should shoot down every plane before one drop? That's what we have live, but that is not the gameplay style now. It changes. The AA needs to hit multiple times to destroy a plane, because aa does certain damage, and planes have HP. That takes time, until a plane goes down. But the CV needs also time to drop all his load. That is the new concept. The "skill" is now: A good CV will know how to dodge a lot of AA fire and pick good targets with the right plane type. A good cruiser will know how to maneuver with the enforced sector and dodge the enemy CV. Hm, with AA practically reduced to self-defense instead of area denial, and with the removal of fighter squads, won't most carrier games start with a direct torpedo bomber strike against the enemy carrier? Who can stop that? You cannot invalidate Flamus performance just because he was "only playing with a new toy". He is still better than 95% of the bobs out there that you and I will have to contend with after next patch. True Fara has more depth in his video, but even he says new CVs are very strong. One DD sailing out in front of a Worchester shouldnt be in huge trouble? One cruiser saling broadside on the a BB shouldnt get punished? The idea of the rework and chip damage isn't what I'm attacking. Its the current implementation where aa is so weak is might aswell not be there. Fighterplanes are the only threat to CV planes at this stage. Also there as long as the speedboost consumable flamu used to strike a CV can be used during attack runs, the whole idea about "needing time" rings rather empty. The CV has fighters, which delete one squad almost instantly. Same kind of fighter get every ship with catapult fighters. They start now 4-6 catapult fighters, which deletes a squads pretty hard. If you looked at the Fara video, he started with torpedos, lost the squad, then he started a second torpedo squad, lost it too, after that he couldn't start a full torpedo squad for the rest of the game, also he has the module for a higher flight capacity, otherwise he would be depeleted on torpedo planes even faster. CVs get self-defence fighter squads that are higly effective. Guess you don't see the depth of it. -An AA-minotaur on live just needs a few seconds to delete a squad. A CV just needs a few seconds to drop the load off. --> AA works fast, drop of the load of the planes works fast. -On the rework the AA has to damage and destroy the planes over time, that takes more than a few seconds. The CV can only drop in small groups over time. --> AA needs time to destroy, CV needs time to drop the load. No idea what you mean with need time, but they nerved the speed in this test round. Also wasting planes leads, that you can't start full squads of the same type. You can see that in the video. A midway needs over 13,5 minutes to reload a full squad of 9 torpedo bombers. Can't say I like the manual AA system. Why is it so big on-screen? Why do I have to click an extra button? Something like the shield management system in Star Trek Online would be better. That just gives you four areas around the model of the ship in the UI which displays damage, HP, etc - if you want to improve your shields, you just click on the area you want to enhance. Two clicks, done. A CV just needs a few seconds to drop the load off. Ah, yes, I must've forgotten that aircraft can just teleport to the drop zone. Reworked CVs drop their ordinance much faster than current CVs ever will. Multiple attacks take far less time to pull off than one full strike in a current CV. RTS just need to approach one time in a few seconds to drop everything off. Thanks for explaining your reasoning, I really am curious. However, I do see the depth (at least so far). But. I'm not talking about the general principles of the new gameplay (there are other threads about this), the topic was more about current toxic balance, next patch and how to cope with it. As I see it, there are CVs and targets untill WG decides to buff AA. To reiterate, I dont see any real counterplay at the moment. At the end of the strike, that CV lost only 1-2 planes out of a full squad and each strike did about the normal DB squad damage (but there is now fewer squads, so that may be okay). Those numbers are disproportionately in the CVs favour compared to present balance, where the CV would lose at least 2/4 squads striking a Minotaur. It's probably fun for the CV, but unlikely to be fun for anyone else. 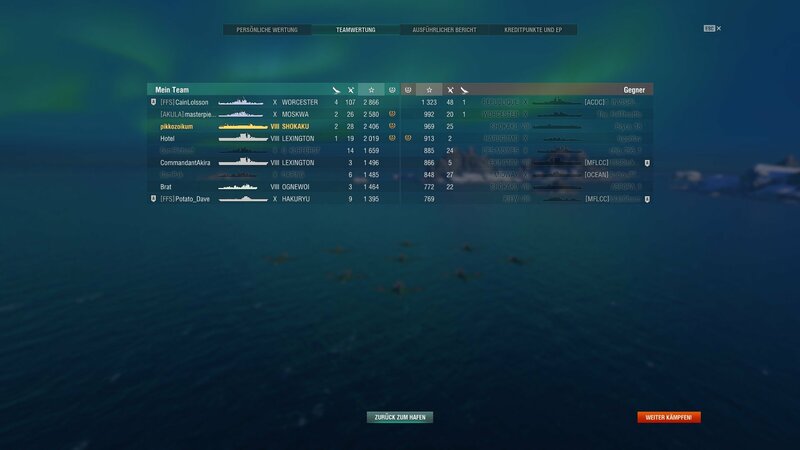 Games consisting of 3-4 CVs will see them mop up the surface combatants for the first 10 minutes, then once BB, DD and CA is dead, the CVs fight it out. However, I do see the depth (at least so far). But. I'm not talking about the general principles of the new gameplay, the topic was more about next patch and how to cope with it. Well, 2 squads are like losing the half squad of the rework, and that defintely happens. Even the Mogami shots down few planes which are like shooting 1 or 2 squads of the RTS. I played the Izumo and hot 4 planes of a T8, that's his half squad. Then needs fly back, service and fly out again. Just circling your target and attacking over and over again is much, MUCH faster than that.